We have an upcoming project. Normally, we prefer waiting until a project is under construction before talking about it. But this one is special, so we are VERY excited about it. 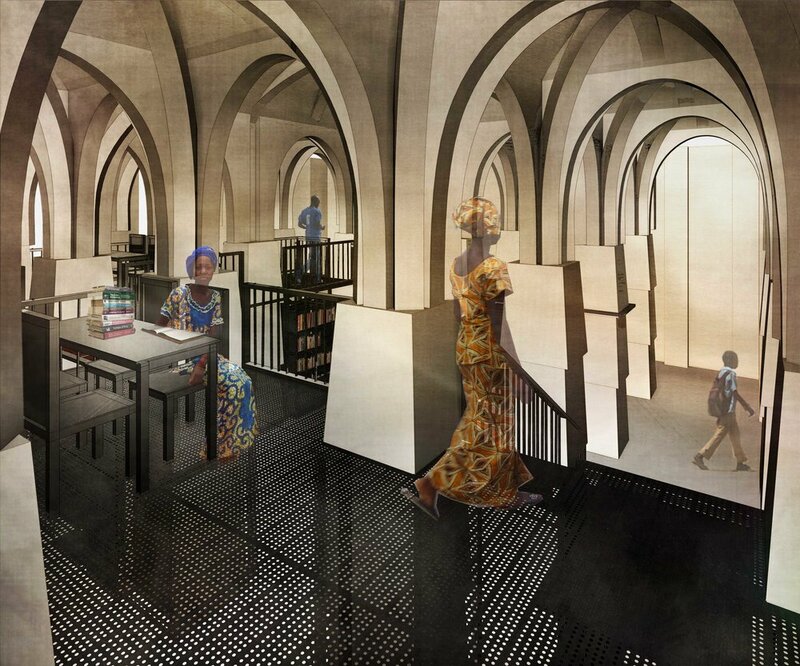 It is an adaptive re-use project we are undertaking in collaboration with fellow architect Yasaman Esmaili in a village of Niger that turns the local mosque into a library. A bit about how this project came to be. Dandagi is a small town in Western Niger with one main landmark: its Friday mosque. The mosque was built about 20 years ago by a master mason called Elhaj' Barmou Falké, a brilliant designer who won the Agha Khan Award for Architecture, no less, in 1986 for a similar mosque he built in the nearby town of Yama. The smaller replica that is the Dandaji mosque has been falling in disrepair in the last few years for lack of maintenance. Made mostly out of Adobe, the building would have needed a yearly upkeep in the form of re-applying plaster to protect it during the rainy season. The images below are very telling of the damage and show the mosque as it was in 2002, then its state in 2013. This situation caused the village residents to entertain the idea of knocking the Adobe mosque down and build a cement replica in its place, which would not need the same level of skillful upkeep. When we found out about this, we started meeting with the community and its leaders and suggested that they change their minds on the basis that the building is a cultural treasure for the entire region, thanks to its builder. The problem however, is that the mosque is currently only used for Friday prayers. Not a good premise for making sure it receives regular upkeep by the community. Clearly the community desires something that is less hassle as no one has the time or knowledge to take the necessary steps for traditional maintenance. As a result, we thought that finding a more productive, daily use for the building could be the answer and motivator. It would of course also entail renovating the structure with improved materials that stand the test of time better. Through several conversations, the idea of a library was floated around and took hold! Though Dandaji has students traveling from neighboring villages to attend its middle-school, one of the few in the area, a library was one amenity the village lacks. Furthermore, there has been a push by the population to build a boarding high school to provide greater access to education for neighboring village children, and the library could help ensure all students have a greater chance for success in their studies and improve their literacy level. Enough that they might be able to attend college in the capital, Niamey. Clearly, a lot could ride on such a program, and discussions with students and their teachers quickly revealed concrete uses, aside from just access to books (which is unprecedented). It could provide quiet, well-lit spaces for group studies and homework, which is challenging in the students' homes as they might not have electricity. A library would be an amazing opportunity for the school children in the village but also for the adults. During our community meetings, the women of the village (who are organized by neighborhood) begged to have an opportunity for adult literacy courses as part of the library's program. We can't wait to see how this evolves as we are now studying material choices experimenting with different additives for mud plasters as well as introducing new more comtemporary materials as part of the renovation.